For what is often described as a hugely rare item on eBay, there seem to be a lot of copies of this Dutch PolyGram compilation about. A straightforward rundown through the group’s hits, all the tracks seem to have been sourced from a copy of The Singles: The First Ten Years. It’s slightly louder and less bright than the CD version of The Singles but the telltale signs of limiting on Waterloo and the short version of The Name of The Game are present and correct. This German release is probably the reason why 1975’s Greatest Hits was the only Polar Abba album that was never released as a European CD during the 1980s. A rerelease of Polydor’s 1976 German double LP set, The Very Best of Abba, the CD version of this compilation shortchanged fans with less than 65 minutes of music spread across the two CDs. There is an incredible 83 minutes of unused capacity on the discs, making Polydor’s decision to remove four tracks from the original LPs’ tracklisting all the more puzzling. Another oddity is the apparent confusion about the name of this set – the original LP set was called The Very Best of Abba but despite using the original LP front artwork, the CD set seems to prefer being called Abba’s Greatest Hits. The release of this title put an end to any prospect of the original Greatest Hits ever being issued in Europe: the Polar album would have simply duplicated this collection and PolyGram would have had to sell it at a lower price point as fans would have been more aware that it would fit on a single CD. 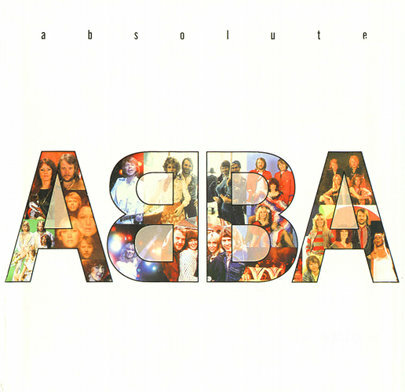 It may have been Abba’s last UK album chart entry until Abba Gold but that doesn’t mean that Absolute Abba is any good. The tracklisting is very solid but the sound quality is wildly inconsistent. It’s almost as though CBS, who licenced the compilation, just used the first tapes that came to hand. Some tracks are incredibly muddy, others are too bright, others have odd limiting problems and The Name of The Game appears in a very odd short edit. It also claims to feature a 1974 version of Ring Ring but plays the standard mix instead. It’s definitely one of the poorer collections released in the 1980s. One of the first British Abba compilations, The Collection is a typically poorly presented compilation by cheapo specialists Castle, which was allegedly licenced from Poplar Music. Sonically, it’s nothing spectacular and its claims that it features one of the 1974 remix versions of Ring Ring are nonsense. 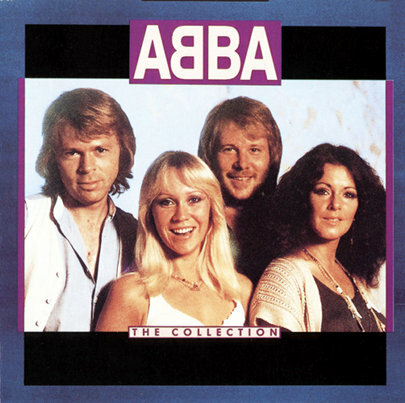 An offensively bad compilation which mashes together Abba Live and most of Ring Ring – the Swedish version of the later album’s title track is missing on the CD version, although it is present on the LP one. The sound quality is dreadful, quite how it got past CBS’s quality control is beyond me. One for completists only. The first readily-available Abba CD compilation set the tone in many respects for those that followed: a smattering of hits, mixed with some rarities and served with variable sound quality with tracks culled from a mixture of tapes, ranging from excellent to downright poor. For instance, The Day Before You Came sounds as good as any other CD of the era yet its b-side Cassandra comes from a mediocre analogue dub while the single edit of Eagle is taken from a particularly badly battered copy. 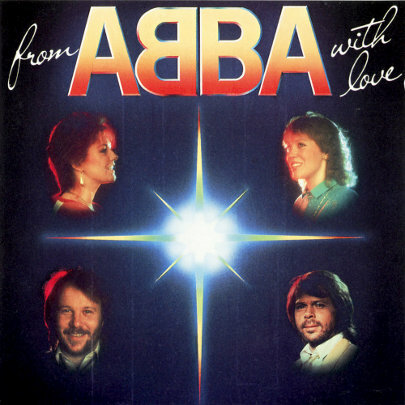 It contains two genuine rarities: the short version of To Turn The Stone, which has only appeared on CD as part of 1983’s ultra-rare I Love Abba compilation and the sole unremastered CD version of 1980 b-side Elaine. 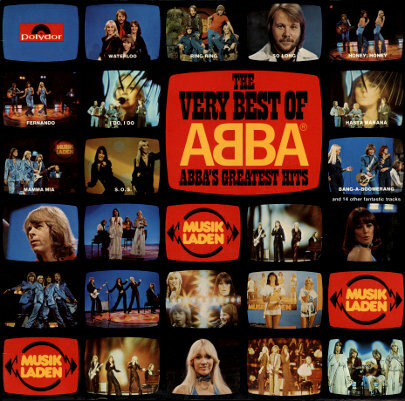 The channels of the 1975 tracks on “ABBA’s Greates Hits” are simply switched, but this was already the case with the original double LP “The Very Best Of ABBA”. The same is true of the German single LP “The Best Of ABBA” (1976 version). The CD version was released during 1989 (not 1988). I think that Polydor/Polygram made a mistake during the release: Maybe they wanted to release the album as a single CD and decided to omit four “no greatest hits” tracks. Then they changed their decision in favor of a double CD release and forgot about the complete track listing. I will give you more information as soon as I can. I honestly don’t know about the stereo image. It’s one of the few compilations I don’t have. Anyone able to check? Concerning The Very Best Of ABBA, it’s indeed puzzling why 4 tracks from the original vinyl album were omitted on the CD version. A shame really, since this is one of my favourite compilations and I would like to have it on CD with all 24 tracks. I remember that the Musikladen special was broadcast in 1976 and later on I got this album. Since I didn’t have the Waterloo and ABBA albums yet, there were so many new ABBA tracks to discover. And I also liked the cover with all those colour pictures from the special. Does this CD have a different stereo mix? I was listening to Hey, Hey Helen the other day and I noticed that the backing vocals in the second verse and in the instrumental break are coming from the left speaker. On other CD releases, they are coming from the right one. Absolute ABBA might be a rubbish compilation but it had a great cover, especially the vinyl with a fabulous spread of ABBA memorabilia inside the gatefold sleeve. 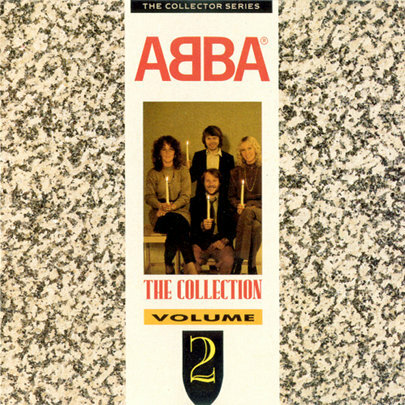 The Collection 2 was the first UK release of both albums Ring Ring and ABBA Live.